Supply chain transparency | Shop Ethical! In our global world, the modern supply-chain is a complex business. 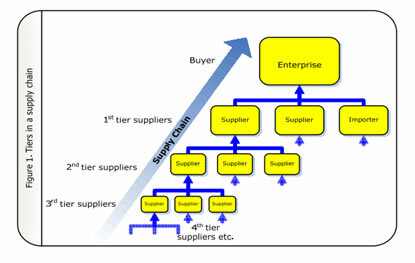 The supply ‘chain’ is in actual fact, more of a pyramid, with suppliers having many suppliers of their own. The number of entities increases almost expodentially throughout the chain and this means that the reality of an organisation being able to control all aspects and impacts of its supply chain is a goal rather than a reality. The garment supply chain involves vast numbers of small businesses through complex outsourcing and sub-contracting arrangements. Those directly involved in production include: designers, growers, wool and cotton brokers, fibre, fabric and garment manufacturers, factory and home-based workers, pattern-makers, “jobbers”, sourcing and licensing agents. Then there are the wholesalers, retailers, marketing staff, consumers and recyclers. And there are also the transport logistics experts, freight forwarders, export and customs staff, not to mention “blokes on motorbikes” sourcing small trims from local markets in Vietnam. These global dimensions of the garment supply chain give some insight into the challenge of understanding all business operations and relationships, and managing them responsibly. See diagram the ‘Natural fibre garment sustainability roadmap‘ for an overview of the many sustainability considerations at each step in the supply chain. (from Travelling Textiles report). The first Australian Fashion Report, launched in August 2013 by Baptist World Aid and Not For Sale Australia, assesses the ethical practices of 128 clothing brands, providing a detailed grading of the systems companies have in place to protect the workers in their supply chain from exploitation, forced labour and child labour. It identified that 61% of the companies assessed do not know where their garments are manufactured; 76% do not know where their garments are weaved, knitted and dyed; and 93% do not know where their cotton is sourced from. See Fairwear’s ‘Supply chains in the clothing industry‘, an educational resource about outworkers in the Australian clothing industry. See String, an online tool that enables companies to log and see each stage of a product’s supply chain, developed by UK company Historic Futures. According to ISO 9000 (ISO, 2000), traceability is Traceability is the ability to identify and trace the history, distribution, location, and application of products, parts, and materials. A traceability system records and follows the trail as products, parts, and materials come from suppliers and are processed and ultimately distributed as end products. Where commonly there is no transparency as to what is going on behind the scences for the average garment, some companies have made it their business and marketing edge to communicate their impact. Patagonia’s ‘The Footprint Chronicles‘ shows the lifecycle journey and environmental footprint of their outdoor clothing products from design through to delivery. Information includes distance traveled, carbon emissions, waste produced, and energy used. New Zealand’s Icebreaker, the world’s largest producer of merino wool outwear, has a “baa code” on the label. Enter it on the website and meet farmers, see what life is like on a sheep station in New Zealand’s Southern Alps, or watch videos that take you to factories in Shanghai, China, where the wool is cleaned, spun and made into sportswear and undergarments. Footwear manufacturer Timberland has ‘nutritional label’ on each shoe box, educating consumers where it was manufactured, how it was produced and what effect it has on the environment. Honest By – clothing fashion retailer from Europe with a claim to 100% transparency. Drill down to any particular product and they give info on the whole chain, including materials, manufacturing, price calculation, and carbon footprint. Often second tier suppliers choose not to disclose some information, but it is still Awesome. Sets new standard in what is possible. See related article. Also see: Cleanmetrics who specialise in carbon footprint analysis for clothing and accessories (also their methodology and data sources page), and the Carbon Footprint Measure of garments . ‘Fashion Scrubs Up’: Manufacturers all over the world discard tonnes of fabric and pollute water during production. Christina Dean, the founder of the NGO ‘Redress’, is hoping to tackle these issues by encouraging manufacturers to make the most of their factory textile waste. (7/2013).